Andy Findlay is the founder and director of this long-running camp. A former All-American and Hall of Famer at Mercyhurst College, he has over 32 years of experience in tennis camps, teaching, coaching, and administration. He limits his summer camps to 60 students/session and maintains a student:pro ratio of no more than 5:1. The Slippery Rock campus, which is 50 miles north of Pittsburgh, has 12 outdoor tennis courts and access to indoor courts nearby. Campers stay in air-conditioned two-person suites with private baths and eat in the dining hall. 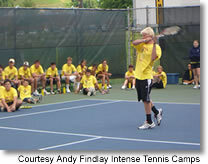 Here's what others have had to say about Andy Findlay's Intense Tennis Camps.